You can contact us through the contact form on our Reservation page. Please include your preferred date & boat and any special requests you might have. In case the contact form does not work, please send an e-mail to vivimex@outlook.com including all the info that is asked for in the contact form. We will get back to you with availability and send you a PayPal link for the deposit. Please note you don't need to have a PayPal account in order to process the deposit. The PayPal link comes with clear instructions, and you should be able to pay with debit or credit card. After receiving the funds, we will send you a complete confirmation. In case you didn't make reservations ahead of time, you can always check with us upon arrival for availability. If you don’t have access to the internet from your hotel/resort, you can give us a call. You might have to ask the front desk for help making this call. The calling system in Mexico is a bit confusing, and prefixes change depending upon what kind of phone you are using and what area you are calling from. All reservations are made by e-mail or phone. We do not have a shop or office near the boats. We operate from Monday thru Saturday. We are closed on Sundays. Departure time in the morning is around 7:30am and departure in the afternoon is around 1:00pm. Please note we don't have a shop or office on the beach. The meeting point mentioned on our web site is the place where our boats are moored; this is not an office. So please e-mail or call Vivian in order to make a reservation. Captain Ivan was raised on Cozumel Island and learned to fish at a very young age from his Dad, who was a local fisherman. In 2008 he founded Fishing with Ivan and started to share his passion for fishing with customers from all over the world. Ivan now has retired from the daily operations and no longer is aboard as a captain or fishing guide. Ivan spends his days on Cozumel again, together with his children and grandchildren. The deposit can be paid with credit card through PayPal. The balance is due the day of your tour, and should be paid in cash, either USD or Mexican Pesos (we don't accept travellers checks). If you want to pay the balance with credit card, you should let us know at least three days before the tour date, and we will send you an additional PayPal link for the indicated amount plus 6% PayPal fees. Please note we can not accept credit cards the day of the tour itself. Yes, we accept pesos without any problem and apply Scotiabank's daily exchange rate. Please note the bank's exchange rate is always higher (but more accurate) than the exchange rates offered at your resort or at the money exchange offices in the street. Is your price per person or per boat? All our prices are per private charter/boat, not per person. 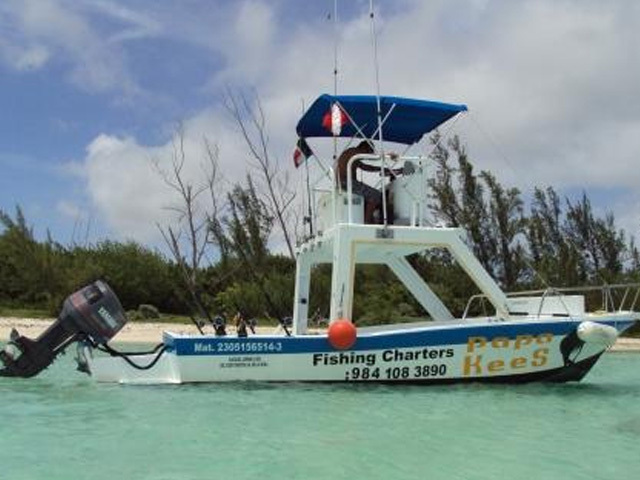 All tours include boat & crew, trolling equipment, bait & tackle, fishing license, snorkeling equipment, bottled water & soft drinks, cooler with ice, cleaning & filleting, taxes & fees. Alcohol or snacks are not provided, but you are welcome to bring your own. Gratuities are not included, but much appreciated. The average tipping percentage in the Riviera Maya service industry ranges from 10 to 20%. Where do I meet my Captain? Departure is from 'Indigo Beach' off 14th Street in downtown Playa del Carmen, where our boats are moored (see map under Reservations). In our final confirmation we will send you complete instructions about where to meet exactly, depending whether you come down by taxi, car or walking. 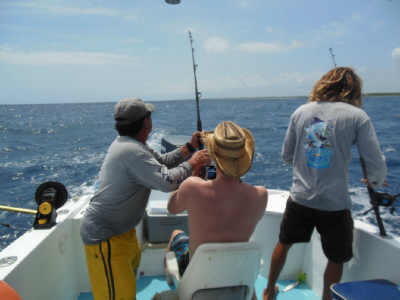 You can also find our location on Google Maps by entering 'Fishing with Ivan, Playa del Carmen, Mexico'. Due to local regulations (harbour master) we are not allowed to offer pick up service with our boats at the resorts. 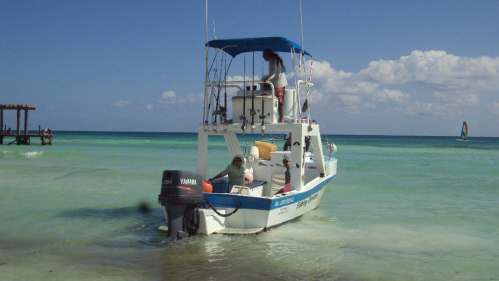 Our location to embark and desembark, is defined as the place where our boats are moored, on the beach off 14th Street in downtown Playa del Carmen. The easiest way to come down from your resort is by taxi. Most resorts offer taxi service 24/7. We recommend to check with the front desk or concierge upon arrival, and if necessary, to make arrangements for a taxi the day before your tour. How do we get on board? Since there are no public piers in Playa del Carmen, all boats are entered directly from the beach. Depending upon weather & water conditions, your captain will bring the boat as close to the beach as possible. This means you will have to wade the water (and sometimes seaweed) till knee or waist level. Be ready to get wet. For this reason we suggest to bring a towel. Is there a wash room on board? Our boats Papa Kees & Cherry have a toilet located in the bow. Don't expect anything fancy; it is a small toilet that does the job in case of emergency! Please be advised that used toilet paper cannot be thrown into the toilet, but should be put into a waste basket/plastic bag. We recommend to bring sun protection/(biodegradable) sun screen, hat, swim suit, camera, snacks and a towel. If you depend upon taxi service to go back to the resort, we suggest to take an extra set of cloths as well. Taxi drivers in general don’t transport people with wet cloths. If you want to bring beer or alcohol, you should buy it a day before your tour, since alcohol is not sold before 9:00am in Mexico. There is limited storage aboard to keep personal things dry. We recommend to bring just the necessary and not to carry big bags. We recommend to keep wallets, cell phones and cameras in sealed plastic bags. Do you have special recommendations for the snorkeling? Snorkeling is an exciting and demanding activity. To snorkel safely, you should not be extremely overweight or out of condition. Your respiratory and circulatory systems must be in good health. Persons with a history of (coronary) heart disease, heart surgery, angina, asthma, epilepsy, current cold or congestion, a severe medical problem or who are under the influence of alcohol or drugs should not snorkel. If you have any other chronic medical condition, are pregnant or taking medications on a regular basis, you should consult your doctor before participating in this activity. For snorkeling you need to know how to swim. The use of a life jacket is not mandatory, but strongly recommended in case you are not a strong swimmer, have limited or no experience with snorkeling or get scared easily. In case you are not offered a life jacket by the crew, please ask for one. All snorkeling equipment (mask, snorkel, fins and life jacket) is provided. For disinfection of the snorkels we recommend to use antibacterial gel, which is available aboard. The best hygienic option is to bring your own snorkel (and possibly mask). During snorkeling you should be careful with sunburn. The best protection against the sun while snorkeling, is wearing shirt and shorts (in the water). Don't forget to put sunscreen on the back of your legs and also include back and bum when not using shirt & shorts. In order to protect the environment, we ask you to use biodegradable sunscreen. Seasickness is one of the mayor disappointments that can happen during a fishing trip. It is always a disappointment for both guests and crew to have to abort a tour for this reason and refunds don't apply. Therefore we don’t recommend this tour for those who have a history of seasickness. If you don’t know if you suffer from seasickness, we strongly recommend to look into some kind of motion sickness medication, together with your physician or local pharmacist. For adults, the more effective option with fewer side effects has been proven to be the ear patch, applied one night before the tour. The ear patch is prescription only, but can mostly be ordered by phone. Some people also have good experience with acupressure wrist bands (or sea bands) against motion sickness. All other drugs like Bonine, Antivert, Dramanine and Gravol do not always seem to be effective and often cause drowsiness and general discomfort. If you opt for these meds, we suggest to start the night before the tour and again one hour before departure. Make sure you purchase your motion sickness medication with your local pharmacist back home, since the only available option in Mexico is Dramamine. Most people feel better with a little bland food on their stomach before getting aboard. Bread, bagels, pancakes, etc. are better than eggs and bacon. Coffee and orange juice are acidic and can cause seasickness. We suggest to eat a little before the tour, but not a lot. Can children join these tours? Since younger children are more sensitive for seasickness, we recommend a minimum age of 10 years to join our tours. For all children we recommend to check with your doctor or local pharmacist for some kind of prevention against seasickness. If your child has suffered from seasickness before, we don't recommend this tour. Life jackets for children are available aboard. If your child is not offered a life jacket at the beginning of the tour, please ask your captain for one. At least one crew member aboard speaks decent ‘fishing’ English. In the final confirmation sheet we ask you to make us a phone call to confirm weather & water conditions, the morning of the tour, before leaving the resort. In case we have to cancel your tour because of bad weather, we will first try to reschedule for another day. If this is not possible due to your or our schedule, we will refund the full deposit. Please keep in mind that options to reschedule are often limited. For the most accurate weather report, we suggest to check Accuweather or Wunderground. Please note the weather in the Caribbean is not very predictable and can easily change overnight. Therefore we suggest to use the weather forecast at most for the next day or two. What kind of fishing do you offer? 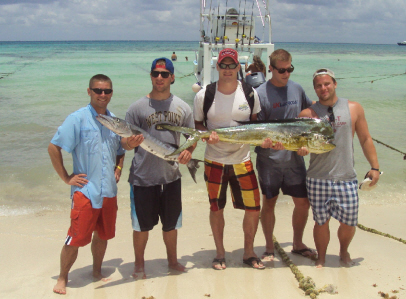 We offer mainly deep sea fishing, which includes trolling and speed jigging (vertical fishing). Trolling for pelagic fish is done by dragging bait with the use of outriggers, downriggers and trolling rods, while the boat is moving at a certain slow speed. We normally have 4 or 5 lines in the water to maximize the chances of catching fish. 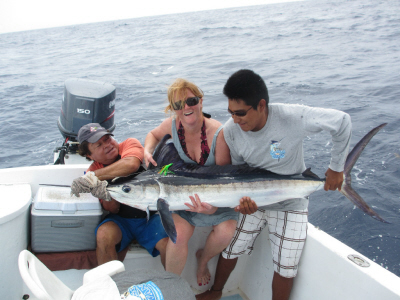 From March thru July, the trolling is normally good for Sailfish, Blue & White marlin and Mahi Mahi (Dorado). 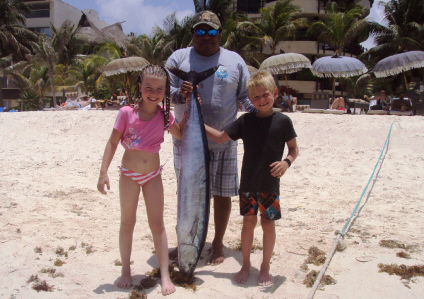 From July thru February the more common catch is Kingfish, Bonito and Wahoo. Barracuda is caught the whole year round. We offer a full service charter which means the crew handles all fishing preparations from rigging lures, baiting lines, setting the hook to cleaning the catch after the tour. As a customer you only have to worry about fighting and reeling in your catch. Setting the hook is the most critical moment when trolling and can make the difference between just a strike and an actual catch. Therefore it is normally done by our experienced crew in order to increase the chances of a successful catch and decrease the risks of losing equipment and possible injuries during this part of the tour. If you would like to participate or be more involved in what we normally consider the crew’s job, just let them know, and they gladly accept your offer as long as safety is guaranteed. For those who don’t have a lot of experience with trolling, we would like to point out that it is a patient sport. On slow days when the fish is not feeding it may happen you won’t get to touch a rod. In winter time from October thru March we also offer speed jigging and target Amberjack and Tuna. Compared to trolling, this is a more active kind of fishing, as it involves quick up & down movements of a weighted jig. We are talking here about vertical fishing in waters of 300-400ft deep with jigs of around 350 gram/12 oz. Speed jigging is hard work, but a great option for those who prefer a more active fishing technique. We recommend anglers to bring their own equipment for speed jigging. In case you do not bring your own equipment, we can provide it for an additional fee. Speed jigging is only offered on our boats Mary Sue and Alondra III. 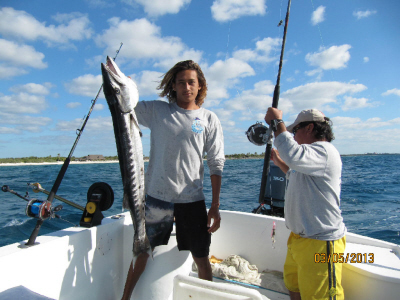 Upon request, we also offer bottom fishing for smaller reef fish like, Snapper, Grouper, Grunt and Trigger among others. 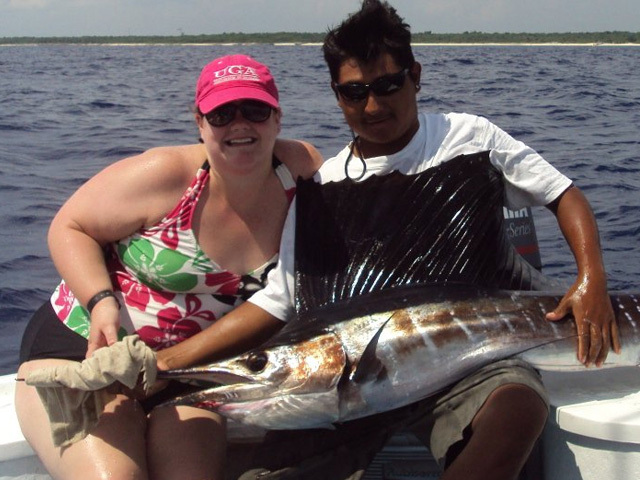 Bottom fishing is done by drifting and dropping lines straight down, either with hand or with smaller spinning rods. Bottom fishing is more affected by the ocean & weather conditions and cannot always be offered due to certain winds, waves or currents. Even on days with little current, lines get entangled easily and for this reason we often only can have 2 lines in the water at once. This means taking turns when there are more than 2 anglers aboard. Often the crew will suggest to use the hand line instead of the spinning rod. The hand line in general gives a better feel in areas with current. Bottom fishing in the ocean cannot be compared to bottom fishing in a lake. What is the difference between the 4 and 6 hour tour? The difference between these tours is just the amount of time. During both tours you will be travelling to the same fishing grounds and will be targeting the same species. The only difference is the time. We only recommend the 6 hour tour for those who have at least some experience with boating on the ocean. IS FISHING BETTER IN THE MORNING? Feeding patterns are affected by many factors including ocean & weather conditions, currents & tides and moon cycle among others. 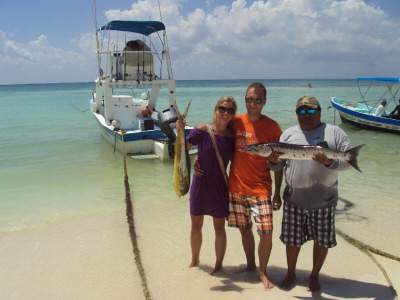 Our experience is that the fishing along the Riviera Maya can be as good in the afternoon as in the morning. The main difference between morning and afternoon are the ocean conditions. The ocean in general is calmer in the morning, as the wind tends to pick up around noon. Therefore there is a slightly higher chance of cancellations of the afternoon tours due to high winds & waves. We use freshly frozen Ballyhoo, which is brought in every couple of days from the port of Dzilam de Bravo on the north coast of the Yucatan Peninsula. We use Ballyhoo for trolling and as cut bait for bottom fishing. Deep sea fishing means travelling far enough away from land in order to reach deeper parts of the ocean and to fish species which only live in the open ocean. In many regions of the world this means one needs to travel beyond the sight of land to reach prime fishing grounds. Along the Riviera Maya though, there is no need to travel this far. Due to the unique topography with the big drop off within one mile from the coast, the main fishing grounds are reached within 10 minutes after departure. We run our boats up and down this drop off, which parallels the coastline for many miles in both directions. It is right here where it gives the best chance at catching big fish, since pelagic predators tend to feed right on top of the drop off. The fact that we stay relatively close to shore does not mean that we necessarily stay in calm waters. This is deep sea fishing and because of the deep water there is always a certain degree of chop. Conditions on the open ocean cannot be compared to a lake. Therefore we don’t recommend this tour for those who have a history of seasickness. IS THERE A LOT OF SEAWEED? During the last couple of years the Riviera Maya and other parts of the Caribbean are experiencing higher than normal amounts of seaweed. This seaweed, called Sargassum, floats free in the ocean and provides a natural and essential habitat for many species of fish including endangered species. With certain ocean currents & winds this seaweed is naturally brought to shore where it can produce an unpleasant view and bad smell, once it begins to decay. This means at times, you will need to wade thru seaweed in order to get aboard. Once aboard and out in clear water, the crew will offer to get your feet rinsed. While regular amounts of seaweed are a good indicator to spot fish, trolling in heavy seaweed conditions can be more of a challenge, especially when it comes to keeping the lines & bait clean. Overall though seaweed provides a habitat for small fish, increases the productivity of the area and when formed up in a line can provide an excellent place to target big game species that have concentrated there. Seaweed conditions unfortunately are unpredictable and can change overnight, for example with a change of wind direction. This means we often we are not aware of the actual situation until we are out on the ocean. As more experienced fishermen know, there are no guarantees when going out fishing. Therefore the sport is called fishing, not catching. Even with the most experienced crew and quality equipment aboard, catching also depends upon feeding patterns which are affected by ocean & weather conditions, moon cycle and tides among others. For this reason we cannot guarantee any catch. Days without catch are a fact and we kindly ask you to keep this in mind when making a reservation. We do NOT offer a so called ‘no catch-no pay’ policy. 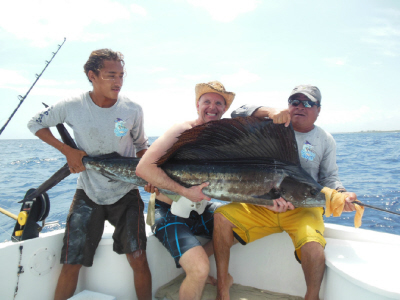 Bill fish like Sailfish and Marlin is caught only on a ‘catch and release’ basis. The Riviera Maya is a heavily fished area and by applying catch & release we assist to keep fish populations from disappearing and make sure future generations will be able to enjoy this sport as well. In general the fish is released after it was brought aboard to make a picture. In some cases the crew might decide to release the fish in the water on the side of the boat (for higher survival chances). All other species can be kept to eat. The crew will clean and fillet your catch, after which you can choose to take it back to your resort, or have it cooked at one of the local restaurants near the boats. The restaurants charge from $7 to $10usd per person for cooking. Alcoholic beverages tend to be pricey and we recommend to ask for prices before ordering. Please note fish species caught in the Caribbean can cause ciguatera. Ciguatera is a foodborn illness caused by eating fish whose flesh is contaminated with a toxin which lives in tropical and subtropical waters. Predator species near the top of the food chain (like Barracuda, Grouper and Amberjack) are most likely to cause ciguatera poisoning, although many other species can cause occasional outbreaks of toxicity. Although chances to get sick are small (the worldwide yearly incidence is aprox. 50,000 people), please inform yourself. Do you provide freezing/shipping service for our catch? Unfortunately there are no freezing and/or shipping facilities in Playa del Carmen. Neither is dry ice for sale. If you want to take your catch back home, we suggest you bring your own vacuum sealer & bags and cooler. 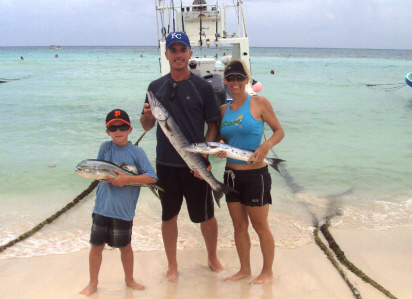 Do you offer shared fishing charters? Our published charters & tours are all private trips. We don't offer shared tours. 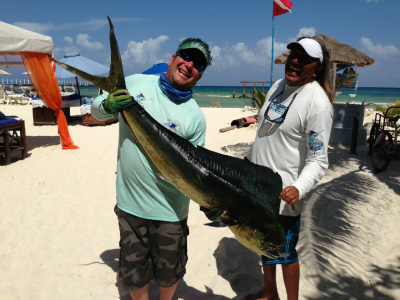 Do I need a fishing license when fishing from land in Mexico? When fishing from land, a pier or dock, you don't need to have a fishing license. 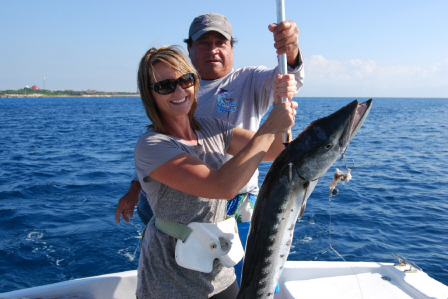 For more information about Mexican Sportfishing Regulations you can have a look at the CONAPESCA web site, Mexico's National Aquaculture and Fishing Commission.